Bill, of course, is a rainmaker—someone with the ability to bring in business. All too often firms rely on a few powerful rainmakers to provide work and revenue for their firms. In a professional services environment, all of the senior professionals are supposed to bring in business. However, even though their compensation is linked to revenue generation, many professionals are uncomfortable with the process, and not very skilled at selling. We believe that in today’s extremely competitive professional services environment, relying on the rainmakers is no longer enough to generate sustained strategic growth and positioning. In virtually every other industry, except professional services, the process of developing business is an integral part of operations. Your clients cannot imagine doing business without strategic marketing and sales plans, and teams of people to manage and implement these functions. Professional services firms have finally accepted marketing and have, to varying degrees, invested in in-house teams and programs of activities. Business development, however, is still not trusted to anyone but the senior professionals. We suggest that it is time for professional services firms to build formal “professional” sales programs to support the business development process. In our experience, there are four key ingredients to building a program that works effectively in a complex professional services environment. The pressure on a firm’s senior professionals is immense. They are expected to find new business, do the work, manage client relationships, profitably manage their practices, recruit, train and mentor staff, innovate service offerings, and in many cases, participate in firm governance. And, while professional services firms invest a significant amount of money on skills training, very few spend much time teaching their professionals to sell, and even more importantly, to “find” new business. Finding new business development opportunities, particularly with prospective clients who have never used your services, is often the most difficult part of the selling process. The more senior the prospective client, the more difficult the effort. In our business development programs we often have to speak with gatekeepers many times, send information, and follow-up diligently before we are able to get permission for a meeting. It can take six to twelve months of multiple touches to gain commitment for an initial meeting —and that is just the beginning! Once you have met the prospective client, you must manage the sometimes very long process of developing the relationship to the point of generating a selling opportunity. Lead generation and pipeline management take a significant amount of time and a great deal of effort and are not an effective use of senior professionals’ time. We recommend dedicated non-billable senior people to formalize, manage and support the business development process. Their job is to identify the highest opportunity prospective clients, determine the most compelling messaging to use in the approach process, and consistently and professionally touch these prospective clients to schedule meetings for the billable team. Once meetings are set, they coach the professionals before each meeting, strategize a follow-up plan, and manage and track each lead through the pipeline. In effect, they become the backstage project managers of the business development process, freeing up busy professionals to do what hey do best —selling and doing the work. A structured selling program managed by a dedicated resource brings rigor and focus to business development activities. As well, because an effective program focuses on the highest opportunity buyers, return on investment of both senior time and marketing expenditures is significantly increased. Successful business development is about touching your prospective clients many times through as many channels as appropriate. An effective new business development campaign integrates brand building marketing activities with a formal calling outreach to schedule meetings and manage opportunities. All activities should be focused on a specific target market with consistent messages that build and reinforce awareness and create an interest in your services. Marketing builds awareness. Sales generates leads, builds a pipeline of opportunities, and closes new business. They support and enhance each other and together become powerful tools to build brand and develop new business. Marketing and communications —An appropriate mix of thought leadership, public relations, briefings, speaking engagements, advertising —to build brand and awareness of capabilities. Rainmaking —All of the senior professionals (not just rainmakers) constantly working their network of contacts to build their personal brands, widen their circle of prospective clients, and close business. Client relationship management —Formal programs to deepen and expand relationships with key revenue clients and nurture clients with service growth potential. 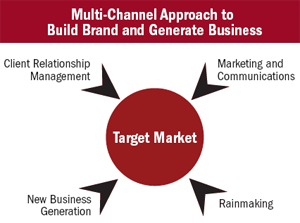 New business generation —Integrated marketing and lead generation programs to find new opportunities and constantly fuel the pipeline of future revenue. Through our research and work with professional services firms, we have found that the most consistently successful firms generate one third of their annual revenue from long-term ongoing client relationships, one third from clients who buy services periodically, and one third from new work from new clients. 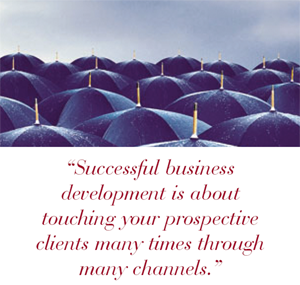 Maintaining that balance requires a multi-channel approach —an integrated marketing and business development strategy and plan, and a team of billable and non-billable professionals, all working together to strategically position and grow the firm —and yes, make rain! Maureen Broderick is President and CEO of Broderick & Company. Broderick works exclusively with professional services firms to develop and implement market strategies that build brand awareness and generate business. Our clients include some of the world’s leading professional services firms. For more information visit www.broderickco.com.